Moist Banana Bread covered in a chocolate swirl topping – a classic banana bread recipe that we all know and love. 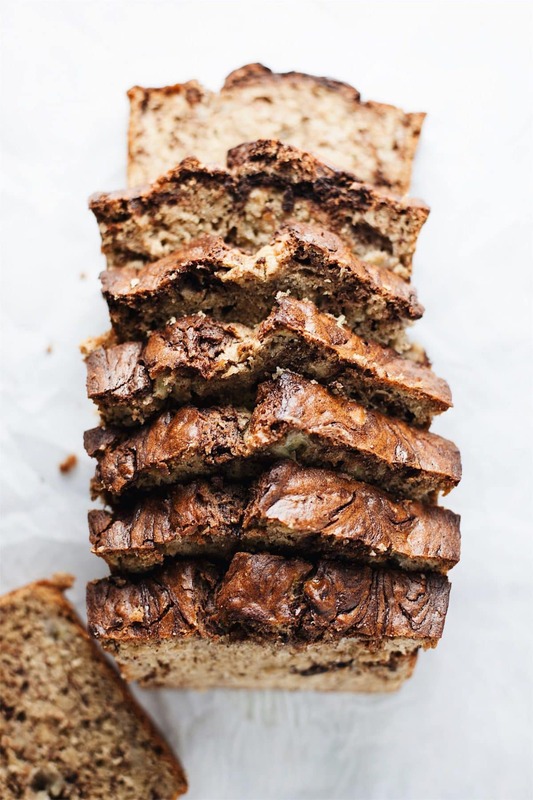 Weekends are for super moist banana bread with a decadent swirl of melted dark chocolate – simple but SO delicious. 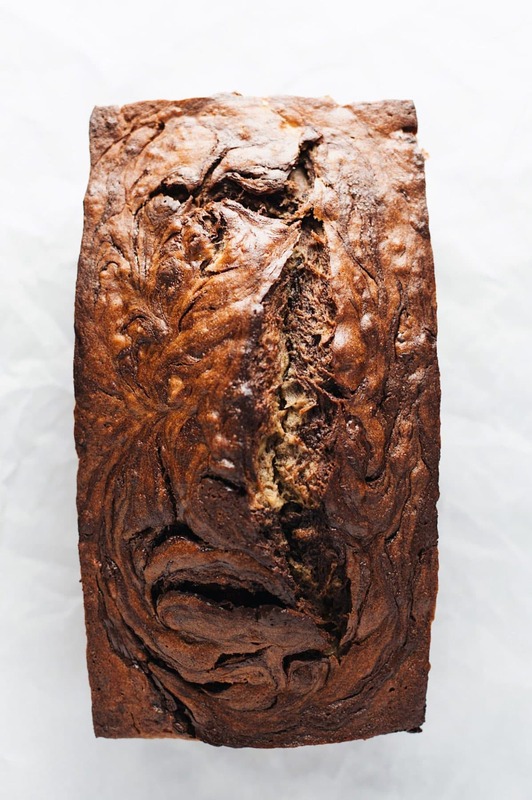 This banana bread is a classic recipe but with chocolate melted over top then swirled with either a toothpick or butter knife. When this banana bread is baking in the oven it smells so sweet. 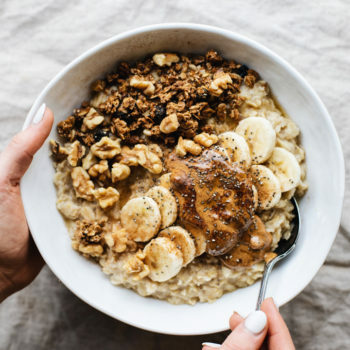 You can enjoy the banana bread as is, or warm in the microwave and spread a little almond butter/peanut butter over top. 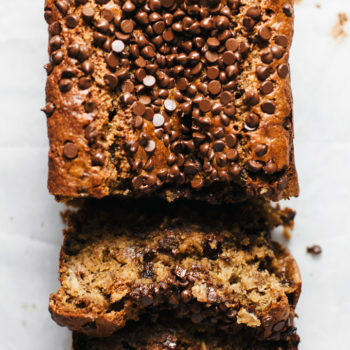 Using brown, extremely ripe bananas makes for the most moist banana bread. 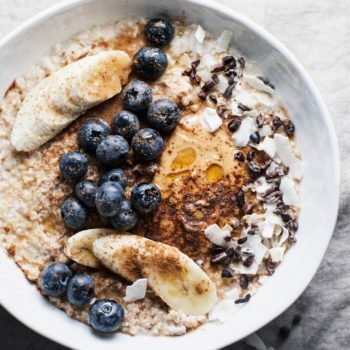 It also helps naturally sweeten banana bread. 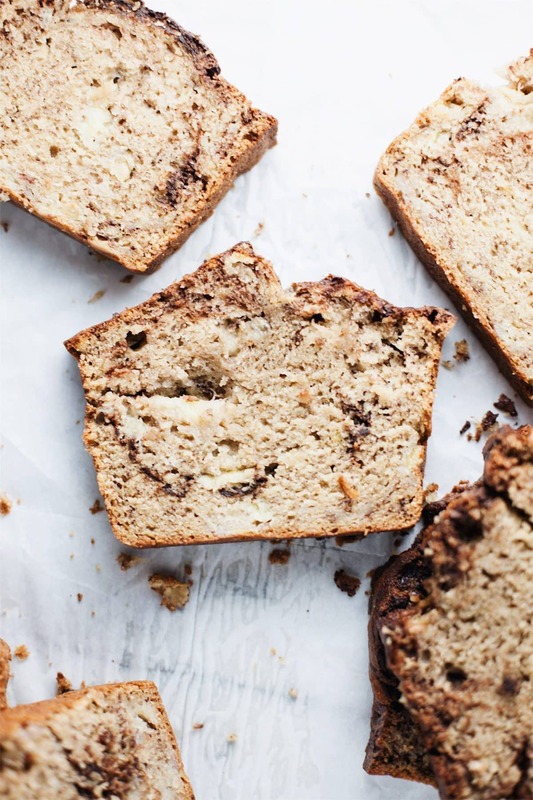 So the more ripe your bananas are – the more moist and sweet your bread with be. Your moist banana bread will stay fresh at room temperature for 1 to 3 days. Store in refrigerator in a sealed container to keep for 1 week. 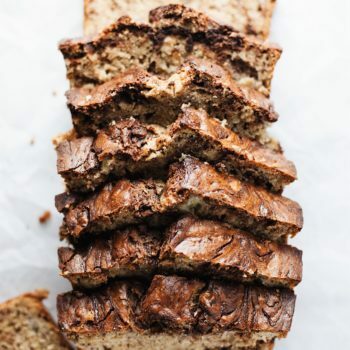 This classic banana bread is a one bowl situation, made with simple pantry ingredients, and all things moist and delicious. What more could you ask for? Soft thick slices of chocolate covered crust and perfectly sweet banana bread is just what you need. If you enjoy this recipe – you may also love my Chocolate Covered Banana Bread Donuts and Flourless Banana Bread. Moist Banana Bread covered in a chocolate swirl topping - a classic banana bread recipe that we all know and love. In electric mixer, mix together bananas, butter, brown sugar, vanilla, cinnamon, salt, and baking soda until smooth. Add eggs in slowly. Then add flour - mix until just incorporated (don't over mix). Grease 9x5-inch loaf pan. Pour batter in, smooth top out. Melt chocolate chips, stir if needed. Pour melted chocolate over bread batter. Bake for 60 minutes - test with tooth pick to make sure center is fully done. Banana bread is good for 1-3 days at room temperature or 1 week refrigerated.